to feed, mineral, or water. A drug is a product used to treat or prevent an illness. Drugs can play an important role in preserving the health of individual sheep and the flock as a whole. However, they need to be used in a responsible manner, and producers should strive to minimize drug use and not use drugs in place of good management and feeding practices. In the US, drugs are approved (for use) by the Food & Drug Administration (FDA). Some drugs may be purchased over-the-counter (OTC), without veterinary approval, whereas other drugs require a veterinary prescription (Rx). OTC drugs are available from from many sources, including veterinarians, feed and farm supply stores, and via the internet. Prescription (Rx) drugs can only be purchased and used under the guidance of a licensed veterinarian. Usually, they must be purchased from a veterinarian. It goes without saying that all drugs should be used in accordance with the manufacturer's label or product insert. Using a drug in any manner that is not specified on the label requries "extra-label" drug use and must meet the requirements of extra-label drug laws. Only licensed veterinarians may use or prescribe drugs extra-label. Extra-label is the proper term. Off-label is not a legal term. Extra-label drugs use requires valid veterinarian-client-patient-relationship (VCPR). Producers are not supposed to use drugs extra-label, even if they can purchase them OTC. In addition to using a drug that is not labeled for a particular species or class, giving a higher dosage of an "approved" drug or administering it in a different manner (SQ vs. IM) also constitutes extra-label drug use. Extra-label drug use is only allowed when the health of an animal is threatened and there is no other treatment alternative. Unapproved drugs cannot be used "off-label" to improve performance or control reproduction. As compared to cattle, horses, and swine, far fewer drugs are approved by FDA for use in sheep. The Minor Use Minor Species (MUMS) law is supposed to make it easier for drug companies to get approvals for sheep. The withdrawal period is the amount of time it takes for a drug to "clear" the animal's system, so that drug residues do not remain in the tissues or milk. Every federally-approved drug or animal health product has a withdrawal period printed on the product label or package insert. When used according to the label, most meat withdrawal periods range from 0 to 60 days. Withdrawal periods may be different for milk and in some cases, the product may not be approved for use in dairy females. Withdrawal periods can be an important consideration when choosing which drug to use to treat a sick animal. Not all drugs have withdrawal periods. Withdrawal periods should be extended when the drug is not used in accordance with the label. In these situations or at any time a producer is uncertain as to the withdrawal period of a certain drug, a veterinarian should be consulted. Veterinarians have access to the Food Animal Residue Avoidance Database (FARAD) which provides withdrawal information for drugs that are used in an extra-label manner. Extra-label withdrawal periods may also be available in the scientific literature. An antibiotic is a medication used to treat or prevent bacterial infections. When used properly, antibiotics are powerful tools for maintaining healthy, productive animals. Not all antibiotics work the same and are effective against the same bacteria or diseases. Sometimes, laboratory cultures are necessary to determine which antibiotic(s) should be used to treat a specific disease. Producers should limit antibiotic treatment to those animals that are sick or at-risk of becoming sick. If antibiotics are not used properly, the opportunity for resistant bacteria to develop increases needlessly and can compromise future antibiotic therapy. Detailed and accurate records of antibiotic treatments and outcomes should be kept. The following table lists the antibiotics that are currently FDA-approved for use in sheep and lambs (in the US). The approved antibiotics vary in their use. As of January 1, 2017, all antibiotics deemed important to humans and mixed in the feed require a veterinary feed directive (a written order). Antibiotics that are put in the drinking water now require a veterinary prescription. Aureomycin is the only antibiotic currently approved for use in the feed for sheep. Under the new regulations, aureomycin may be fed at a rate of 80 mg per head per day for prevention of abortion caused by campylobacter spp. Antibiotics can no long be fed to lambs to improve growth and feed efficiency. When deemed necessary, the following antibiotics may be prescribed for use in sheep by veterinarians (only). When using drugs extra-label, you cannot assume the withdrawal period indicated on the label is adequate for sheep. 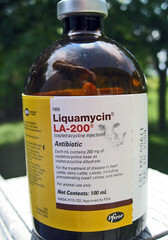 LA-200® is a long-acting broad spectrum antibiotic. Nuflor® is commonly used to treat pneumonia. Zactran® has proven to be effective at eradicating foot root from a flock. 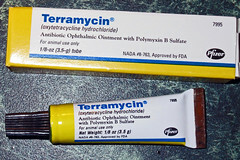 Antibiotic for use in cattle and horses. Sub-therapeutic means below the dosage level to treat disease. Sub-therapeutic levels of antibiotics have been fed to sheep and/or lambs to prevent disease outbreaks. Feeding antibiotics to ewes during late pregnancy can help to control abortions. When a ewe has been assisted in the delivery of her lamb(s), it is recommended that she be given an antibiotic to prevent uterine infections. Antibiotic use is prohibited under USDA certified organic standards of livestock and meat production. While it is not recommended that treatment be withheld from a sick animal, if an animal is treated with an antibiotic, it can no longer be marketed as certified organic. Its milk or dairy products cannot be used to make organic products. An anthelmintic is a medication that kills worms. It is also called a "dewormer" or anti-parasitic drug. Anthelmintics are available as drenches, boluses, pastes, injectables, pour-ons, and as products that you mix with the feed. All anthelmintics may be purchased over-the-counter. 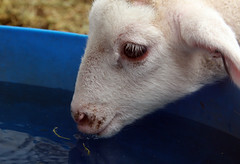 While different formulations are available OTC, it is recommended that sheep and lambs always be treated with oral products: drenches (and boluses). These formulations are usually more effective and less likely to promote drug resistance. 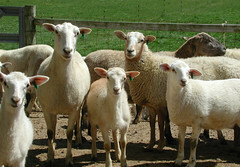 In the U.S., they are the only products FDA-approved for use in sheep and lambs. Several new anthelmintics including Zolvix® (monepantel) and Startect® (derquantel + abamectin) are available for use in other countries. When treating sheep for internal parasites, you need to make sure you give them the proper dose. Underdosing promotes the development of drug-resistant worms. 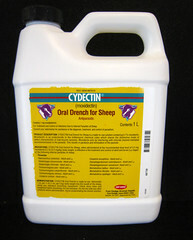 Anthelmintics should be delivered over the sheep's tongue using a syringe with a long metal nozzle. Injectable dewormers should not be squirted in the sheep's mouth, nor should pour-on dewormers be administered orally. It is not recommended that sheep and lambs be dewormed on a regular or scheduled basis or that all animals in a group be treated with an anthelmintic. Targeted selective treatment (TST) should be integrated with other worm control practices such as pasture rest and rotation, mixed species grazing, alternative forages, zero grazing, and genetic selection. It is now recommended that clinically-parasized animals be given combination treatments. While combination products are available in other countries, in the US, this requires purchasing and adminstering each anthelmintic separately and singly. Anthelmintics should not be mixed, as they are not chemicaly compatible. When giving combination treatments, a full dose of each anthelmintic should be administered. The dewormers can be given one after the other. The withdrawal period of the dewormer with the longest withdrawal should be followed (usually Cydectin®). Under USDA organic standards, an anthelmintic may only be given to a ewe during the last third of gestation. Animals destined for slaughter cannot be dewormed. While it is not recommended that treatment be withheld from a clinically-parasitized animal, if it is treated, it can no longer be sold as certified organic, even if proper or extended withdrawal periods are observed. Copper oxide wire particles (COWP) offer a treatment alternative to synthetic dewormers. While copper sulfate is a historical dewormer which sometimes caused copper toxicity in sheep, COWP are a less absorbable form of copper that have demonstrated efficacy against barber pole worm infections in sheep and goats. More recent research has shown that COWP when used conjunction with a commercial dewormer (e.g. Valbazen®) can increase treatment efficacy. COWP are available as a copper supplement for cattle (12.5 and 25 g) and goats (2 and 4 g). 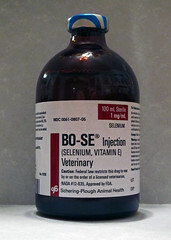 The boluses should be repackaged into smaller dosages for sheep and lambs. Dosage is based on age not weight. Typically, lambs are given a 0.5 to 1 g, while ewes are given a 1-2 g dosage. It is recommended that sheep producers learn the copper status of their animals and farm before including COWP in the their internal parasite control program. A coccidiostat is a compound added to animal feed to inhibit or delay the development of coccidia, a protozoan parasite that causes scouring and damage to the lining of the small intestines. Ionophores are classified as antibiotics by FDA; however, their use was not affected by the 2017 Veterinary Feed Directive, as they are not medically important to people. In the U.S., Bovatec® (lasalocid) is approved as a coccidiostat for sheep maintained in confinement. Twenty to 30 grams of Bovatec® may be mixed in a ton of sheep feed. Ionophores are not permitted under USDA organic standards, even though there is no slaughter withdrawal and ionophores are not used in people. 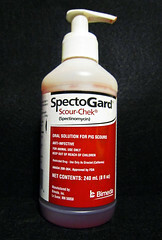 Deccox® (decoquinate) is also approved as a coccidiostat for young sheep. It can be mixed in the feed or milk replacer. Rumensin® (monensin) is not approved for use in sheep, but can be prescribed by a veterinarian extra-label, if the other coccidiostats are determined to be ineffective. Rumensin® is toxic to members of the equine family and can be toxic to sheep if it is not mixed properly. Corid® (amprolium) is the only coccidia drug that can be used as both a preventative and treatment for coccidiosis. 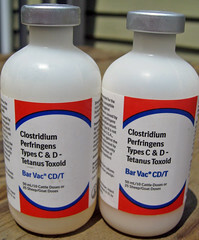 It can be mixed in the drinking water to prevent outbreaks of coccidiosis or it can be administered to individual animals at a higher dose to treat clinical coccidiosis. It is a better treatment than preventative. Corid has a unique mode of action. It mimics thiamine (vitamin B12). When the coccidia ingest Corid, they experience thiamine deficiency and starve from malnutrition. 1.25 to 2.5 g/100 lbs. 4 cc of 12% solution/25 lbs. 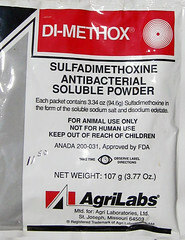 Sulfa drugs are also used to treat coccidiosis. Like Corid®, sulfa antibiotics are put in the drinking water or administered as a drench. 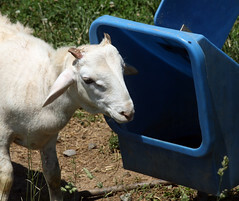 Corid® and sulfa drugs are not FDA-approved for use in sheep and goats. Their use requires veterinary approval. While Corid® was not affected by the 2017 Veterinary Feed Directive, the marketing status of sulfa antibiotics, such as Di-Methox® changed from OTC to Rx. Sulfa antibiotics must now be obtained from a veterinarian. In other species and countries, there are several other options for preventing and treating coccidiosis. Baycox (toltrazuril) is a one-dose oral treatment for control of coccidiosis. Ponazuril, a derivative of toltrazuril is also used to treat coccidial infections. 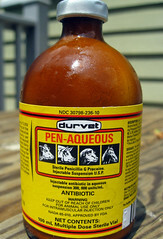 In the U.S., it is marketed as Marquis® (Rx for horses). Vecoxan® (diclazuril) is another oral suspection that can be used to prevent or treat coccidiosis. Its advantage is that it has a zero day withdrawal, whereas toltrazuril has a 42 day withdrawal period for lambs. A vaccine is a biological preparation that is used to establish or improve immunity to a particular disease. Sheep and lambs are commonly vaccinated for clostridial diseases and other diseases as situations warrant. A vaccine stimulates the body's defense system to build immunity to a particular disease, by exposing the animal to either the live organism in a safe form (e.g. sore mouth) or to a killed or inactivated organism or part of an organism (e.g. clostrididal diseases). Vaccinations in an annual program require an initial dose the first year followed by a booster to provide maximum protection. Anti-toxins can be used in disease outbreaks or to provide immediate short-term immunity. 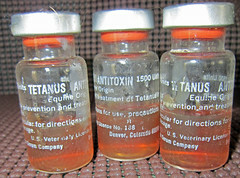 In sheep, the tetanus anti-toxin can be given to lambs at the time of docking and/or castration, especially if the lamb's dam was not vaccinated. Most vaccines are administered by giving an injection under-the-skin (subcutaneous). A few vaccines are administered intramuscularly and occasionally some are given topically (e.g., soremouth vaccine) or intranasally. If there is a choice, subcutaneous injections should be given, as this causes less damage to muscle tissue. It is important to always follow label directions when giving vaccines. Proper handling of vaccines is important to prevent vaccination failure. Vaccines are sensitive to light and should be refrigerated. Vaccines are not always effective in the face of an overwhelming disease challenge. A clean needle should always be used to draw vaccine out of a bottle. Ideally, a clean needle is used for each animal. Unlike antibiotics and anthelmintics, all USDA and third party labeling and certification programs allow the use of vaccines for disease prevention. 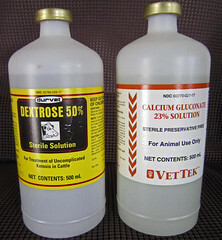 Sometimes other injectables are used to treat health problems in sheep. For a producer to adminster many of these injectables, the product(s) must be purchased from and used under the guidance of a licensed veterinarian. Treat glucose deficiency (e.g. ketosis). Nutrient replenisher. PGF-2A Rx Causes the regression of the corpus luteum in cattle. Induce parturition in swine. Uterine contractor. To assist in birthings and milk let down. Vitamin B1 Rx To treat thiamine deficiency (polioencephalomalacia) Consult veterinarian. 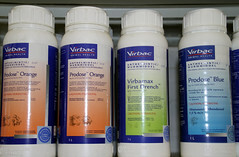 Oral products are used to treat disease conditions or provide supportive therapy to diseased or stressed animals. 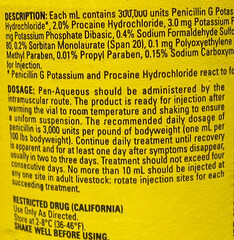 Unlike many of the injectables listed above, they can usually purchased OTC and be used without veterinary oversight. Orals are commonly used to treat sheep with digestive upsets or to provide supplemental nutrition to sick or stressed animals. For control of non-infectious diarrhea. (many brands) Supplemental supply of electrolytes and fluids. To rehydrate sick animals. Nutritional supplement for stressed animals. 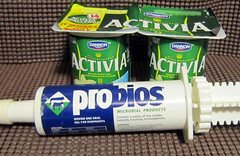 Restore healthy bacteria to digestive system. Nutritional supplement for stressed sheep/lambs. 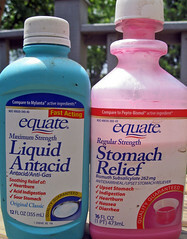 To treat frothy bloat in cattle. Various products found around the house can often be used to treat sheep and lambs for simple health problems. In some cases, they can replace more expensive commercial products or supplements. Like the oral treatments in the table above, they are used primarily to treat digestive upsets and provide supplemental nutrition to stressed animals. Household remedies are used on a trial-and-error basis. Generally, there is no scientific basis for their use and they may not be as effective as the commercial products. Medications do little good, unless they are administered properly. You can also kill or cause permanent damage to an animal if you do not administer the medication properly. Before any treatments are given, the animal must be properly restrained. Only clean needles and syringes should be used for giving injections. A clean needle should be used to draw solution out of a bottle. 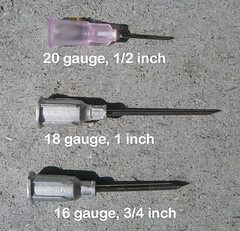 The recommended length and gauge of the needle will depend upon the size of the animal and the thickness of the solution. Generally, use the smallest gauge needle that is suitable. A 1/2 inch 18 gauge needle is ideal for vaccinating. 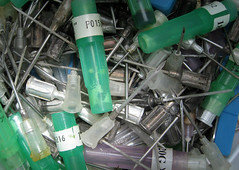 Needles are inexpensive and should be disposed of after use. The best place to give subcutaneous injections is in the loose skin of the axilla (armpit) or over the ribs. Intramuscular injections should be given in the neck muscle. While the large muscle mass of the thigh may seem like the logical place to given an intramuscular injection, this will cause damage to the meat. When repeating injections, use the opposite side of the animal for the second injection. Never inject more than 5 ml at one site. 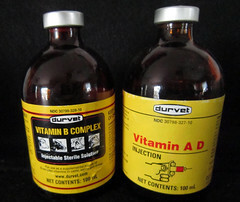 Very few drugs need to be given intravenously; although the same technique is used to collect blood samples. It takes some skill to locate a vein (usually the jugular) and keep the needle in place while the drug is being given. IV drugs should be injected slowly, as animals will react very quickly, with the drug dispersing to all the tissues and going straight to the heart. An intraperitoneal injection should only be attempted by a skilled person who is familiar with anatomy, as improper technique can cause peritonitis. 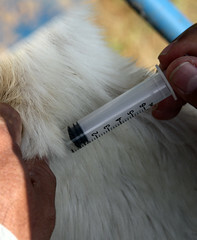 An intraperitoneal injection is most commonly given to a hypothermic lamb. While the lamb is hanging from its front legs the needle is inserted perpendicular to the skin, approximately 1 inch to the side of and 1 inch caudal to the navel. 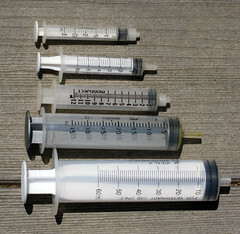 Intramammary "injections" (infusions) are given using a long-neck tube instead of a needle. The tube is delicately inserted into the teat sphincter. It goes without saying that the end of the teat should be cleaned before inserting the tube into the teat canal. If the animal receiving the injection will be used for meat, make sure you check the withdrawal times. Slaughter withdrawal times for most vaccines are 21 days. Meat withdrawal periods for antibiotics and other injectables vary. Be sure to check the label or consult with a veterinarian. 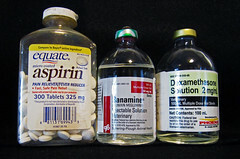 When a drug is used extra label, its withdrawal time may be longer than what is listed on the label for the approved species. Sharps should be properly disposed of. Sharps include needles, syringes, scalpel blades, slides, pipettes,and anything else that can puncture. 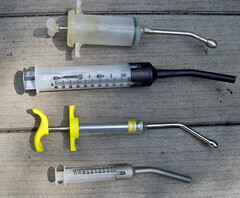 Sharps should be collected on the farm in a rigid, puncture-resistant container with a screw-on or tightly secured lid. Containers should be visibly labeled as biohazardous material. Once full, they should be taken to an approved collection facility for medical or veterinary waste. Expired and unused medicine should be disposed of in the same manner as sharps. Drenching is when liquid medicine is poured down the animal's throat. 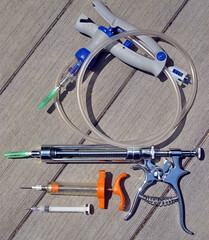 An oral syringe with a long metal nozlze should be used for drenching. Automatic drench guns can be used for large numbers of animals. To drench, you should place a hand under the animal's head and tilt it slightly to the side. The gun nozzle should be placed in the gap between the molar and incisor teeth and then over the back of the tongue. If the medicine is placed in the mouth, it may by-pass the rumen as it escapes down the esophageal groove. The animal should swallow before the gun is removed. Covering the animal's nostrils will encourage swallowing. Poor drenching technique can cause aspiration pneumonia (an infection of the lungs caused by breathing in foreign material). 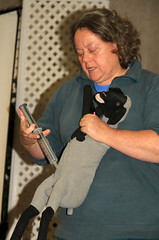 To prevent medicine from entering the animal's bronchial tubes or lungs, the animal's head should be held horizontally. It should not be tilted up. Drench guns should not be forced down the animal's throat. 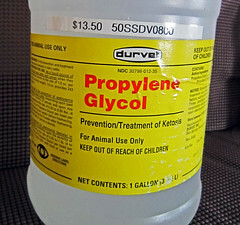 Drenches should not be administered faster than the animal can swallow. 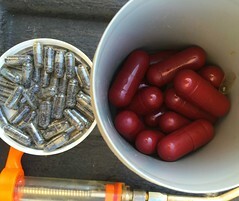 Sheep and lambs can be given boluses (or capsules) by using a balling gun. A balling gun is a plastic or metal tube with a capsule holder on one end and a plunger on the other end (to eject the capsules). Balling guns are available in different sizes. Young animal balling guns are suitable for sheep and lambs. The balling gun is inserted into the animal's mouth in the same manner as drenching. The plunger should not be depressed until the end of the gun is over the base of the tongue. Otherwise, the pill may be chewed or spit out by the animal. The American Sheep Industry Association (ASI) began development of an industry-wide quality and safety assurance program in 1991. Quality assurance programs provide assurances to consumers that products have been produced in accordance with certain standards, including the proper use of animal health products. USDA and third party certification groups that do not allow the use of antibiotics, anthelmintics, coccidiostats, and other animal health products do so without any scientific basis or contribution to animal welfare. As with people, sometimes drugs are necessary to maintain the health and well-being of farm animals. It is safe to consume the milk and meat from treated animals, if proper withdrawal times have been observed. There is widespread disagreement with regards to animal agriculture's role in the development of antibiotic-resistant bacteria. Information on the subject is often biased and sensationalized. Due to its small size and diversified production systems, the sheep industry likely has no contribution to the development of resistant bacteria. Yet regulations which restrict antibiotic use are especially detrimental to minor species like sheep, as there are few products FDA-approved (for sheep) and a dearth of veterinarians willing to work with small ruminants. Increased regulations will signifcantly reduce the health and welfare of sheep and lambs, while likely having no effect on the development of resistant bacteria. Late updated 16-Mar-2019 by Susan Schoenian.